I am back on the meal planning kick and stocking my freezer. Freezer cooking is one way I can get a grip on meal planning. 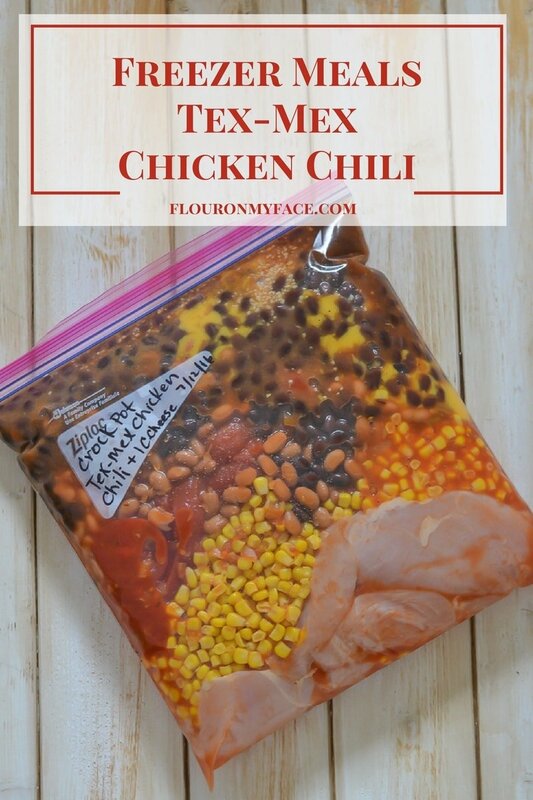 This Freezer Meals Tex-Mex Chicken Chili recipe is a favorite around here. Take the 2017 Flour On My Face Reader Survey and be a part of deciding what kind of recipes I share in the upcoming months. Survey closes on Sunday. Add your name to the hat for a chance to win a $25 Amazon gift card! I was much better at meal planning when my kids were small. I had a grocery store budget that I strictly followed. It helped me stay within the amount of money I had to spend every week on groceries. Now that I am older and wiser even though my family is smaller I have learned a few things I wish I had known when I was a working mom. Like, most families there was a time when I had to work outside of the home to help out with money. I was lucky enough to be able to stay home after the birth of each of my kids for a period of time. I was a breast feeding mother and as much of a struggle financially that is was we decided I would stay home while I was breast feeding. Meal planning at that time was a life saver. I had no idea what freezer cooking was back then. Boy, how I wish I did! I mean I would of course buy chicken or ground beef when it was on sale for the week when I went grocery shopping. My idea of freezer meals was I’d get home and stick the packages of meat I bought in the freezer for meals later on in the week. I had no idea I could put a ready made meal like this crock pot Tex-Mex chicken chili recipe in a freezer bag with all the ingredients and simply thaw it out and pop it in the crock pot to cook whenever I wanted. Freezer Meals would have been a blessing to know about back then. Freezer meals are a blessing now! Even though most of my kids have moved out and started their own families now that I know about freezer cooking I have jumped in head first. Right now my freezer is stocked, not only with freezer meals but I have been a vacuum sealing fool. Ever since I got a FoodSaver vacuum sealer I have been vacuum sealing everything. Save more money on groceries with a vacuum sealing system. Did you know that by vacuum sealing any food item and I mean fresh fruits, vegetables, freezer meals, meats and even your pantry staples you can extend the shelf life up to five times! I had no idea. I hate when I buy something on sale and stick it in the fridge to cook or eat and by the time I get around to eat it it has started to go bad. Now I just vacuum seal my fresh berries and fresh veggies and they last so much longer. No more wasting money and throwing food away for me! 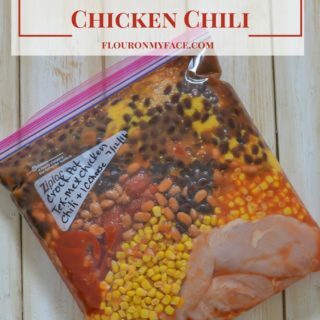 I actually made this Freezer Meals-Crock Pot Tex-Mex Chicken Chili recipe before I got a FoodSaver vacuum sealing system so I froze it in a regular freezer bag. Now I am vacuum sealing my freezer meal recipes and they will last even longer. Now I can really take advantage of the grocery store sale prices and I won’t have to worry that the bulk food I bought on sale ends up getting wasted because I over bought and couldn’t use it before it went bad. I know a FoodSaver vacuum sealing system is a pricey investment and might not be for everyone. But if you have a birthday coming up it you could ask a few family members to chip in. Within a matter of months it will pay for itself. I’m not kidding. I recently bought a flat of Florida strawberries. Usually strawberries will start to go bad after just a few days in the refrigerator. I vacuum sealed a bunch the strawberries and froze them. Then I vacuum sealed some of the fresh berries and put them in the refrigerator 3 weeks ago. Those vacuumed sealed strawberries are still good and fresh. Do you see that little gadget holding open my freezer bag? I love that thing. 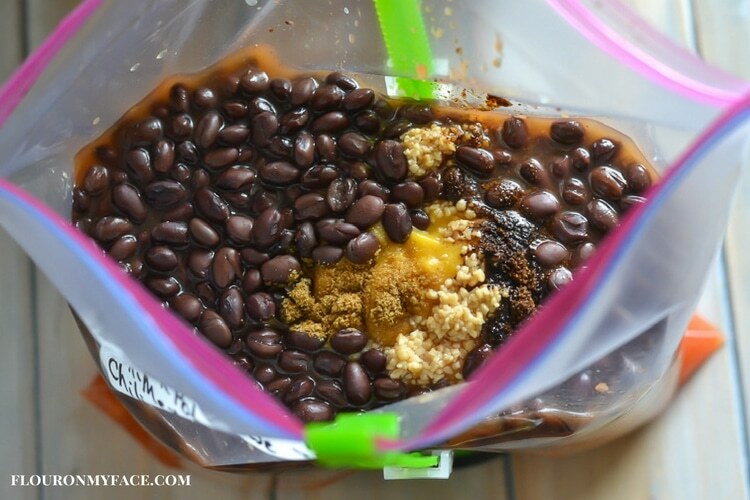 It has made filling my freezer bags so much easier. It’s called a Hands Free Bag Holder. I use it all the time. You can even recycle your zip lock bags and turn them upside down to dry on it. Thanks to that little bag holder I figured out a trick with my FoodSaver when vacuum sealing wet foods. I’ll save that tip for another day. The day I made up my Freezer Meal Crock Pot Tex-Mex Chicken Chili I was making a few different freezer meals as you can see from the photo. I made Freezer Meal Crock Pot Chicken Corn Chowder, Freezer Meal Crock Pot Vegetarian Chili. The freezer meal chicken corn chowder is already on the blog but the Vegetarian Chili is coming soon. Place all the ingredients except the cheese into a freezer bag. 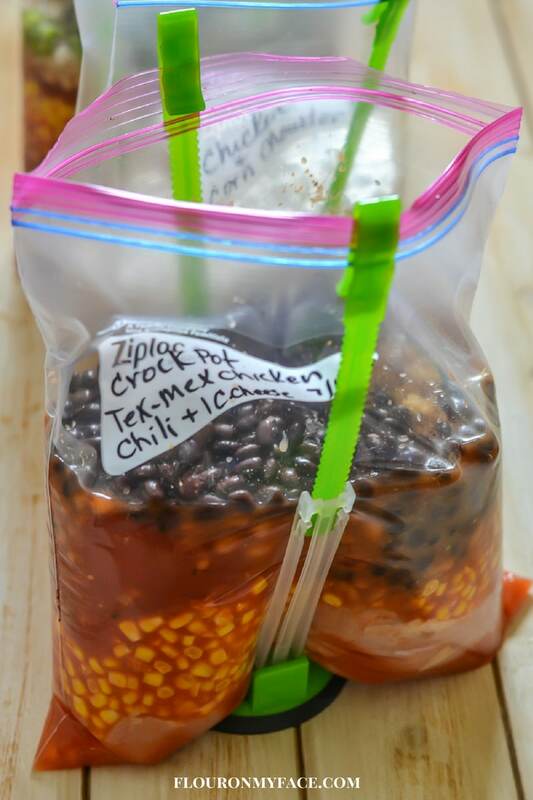 Thaw the Freezer Meals Tex-Mex Chicken Chili in the refrigerator overnight. Cook on medium high until boiling. Reduce heat and simmer for 2-3 hours. Chili is done when the chicken is cooked through. If using whole or chicken breast halves cooking time will be longer. If using whole pieces of chicken the chicken is done when it is no longer pink in the center or reaches 165 F. on a meat thermometer. If using bite size pieces of chicken cook about 2 hours. Top each serving with 1/4 cup of shredded cheese. To cook the Freezer Meals-Tex-Mex Chicken Chili recipe in the crock pot slow cooker see my Crock Pot Tex-Mex Chicken Chili post. Get your meal planning in order and stock the freezer with this Freezer Meal Tex-Mex Chicken Chili recipe. Cooking instructions for stove top cooking and crock pot cooking included. To Cook Tex-Mex Chicken Chili in the crock pot see my Crock Pot Tex-Mex Chicken Chili recipe.